John Stuart Reid and Annaliese Kohinoor (Reid) illustrate how sound is fast regaining its place as the pre-eminent healing modality. Having been first used by the ancients, sound therapy has undergone a period of re-discovery and is now poised to reveal the intricacies of healing both the cellular and psychological levels. There is now a mass of research into the healing benefits of ultrasound, including its use in breaking up kidney stones and even shrinking tumours. 1-3 In addition, infrasound and audible sound arenow recognized as having immense healing properties. In the beginning was the Word. And the Word was with God, and the Word was God. St. John's Gospel, Ch1, v 1. Many spiritual traditions speak of sound as being the formative force of creation. Before focusing on current research into sound healing, let us consider the vital role sound may have played in structuring our universe. Recent studies point to sound as having reigned supreme as the prime organizing force of all matter, especially during the first million years of creation.4 Of course, sound cannot travel in the vacuum of space but sound can travel wherever matter is dense enough to allow atoms or molecules to collide with each other. In fact, it is this process of collision that provides a clear definition of sound: The passing on of vibrational data at the moment of collision between any two atoms or molecules. Although invisible, sound is actually highly structured. In water it acts to form ‘micro-sonic scaffolding', a structuring process that causes matter to coalesce in an orderly manner. We believe it was this dynamic, sonic mechanism that sparked life. Sound and life, it seems, are inextricably linked. One of the greatest mysteries in understanding how life evolved concerns the helical nature of DNA and how this complex structure originated. Recent research has demonstrated that vortices in both the macro and micro realms can be created in water. The dynamics necessary to create micro-vortices in the ancient seas may have derived from the bubbling sounds of hydrothermal vents or massive surface storms. Water acts as an acoustic filter, so the sound of the waves would become increasingly pure as the depth increased. This pure form of sound would, theoretically, power the vortex-forming mechanism. In the 1940s and ‘50s, Viktor Schauberger, the brilliant Austrian scientist, was probably the first to study micro-vortices in water.5 These spiral-like forms may be the missing key to the origins of life since the fundamental shape of a micro-vortex is similar to the spiral helix of DNA. Perhaps the DNA's double-helix pattern was a consequence of sound, something we expect further research to clarify. If the dynamic force that created life is ultimately proven to be sound, then it is interesting to note that a group of Hon Kong scientist have demonstrated that DNA molecules can be manipulated through a micro-vortex.7 The group may have inadvertently tapped into the very secret of life itself. Their work may inspire others to develop a better model of how life evolved and lead to a fuller understanding of sound healing. Phi, often referred to as the Golden Mean, is the ratio of 1 to approximately 1.618. It is perhaps the most important constant seen in CymaGlyphs as it is prevalent in all living things. Gyorgy Doczi's wonderful book, The Power of Limits, illustrates this point with great flair. Fig. 1a (left): Liquid CymaGlyph in a drop of water under the influence of sound. Note the fine tendrils emerging from nodal points, evidence of sonic scaffolding. Image created on the CymaScope by Erik Larson. Fig 1b (right): Liquid Cymaglyph in a drop of water under the influence of sound. Note the matrix of tubular macro vortices, in particular the vortex that begins near the three o'clock position and snakes up to the two o'clock position before tracking further left. Image created on the CymaScope by Erik Larson. Fig. 2a (left): A pentagon form created by a low frequency sine tone, demonstrating that sound and life are inextricably linked: Sound can create pentagonal structures which contain phi, the physical constant of all life. Image by Erik Larson, Sonic Age America. Fig. 2b (right): The pentagon contains phi, the Golden Mean, the ration 1:1.618, that is prevalent in all life. Fig. 3a (left): Many species of Radiloaria exhibit angular surface structures, often involving hexagons and pentagons. Fig. 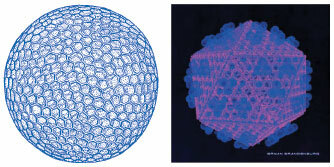 3b (right): Many viruses exhibit polygonal outer shells. He analyses sea creatures, shells, butterflies, flowers and many other life forms to vilaidate th phi ratio as one of the defining characteristics of life. One group of researchers has proposed that the earliest life forms were viruses, which are typically angular in structure, unlike the globular nature of bacterial life.8 Angular sound structures are commonly observed on the CymaScope, providing us with a hypothetical model for the way in which the earliest life forms were shaped in the ancient seas. The surfaces of microscopic bubbles, created near hydrothermal vents, could have been host to angular patterns of sonic vibration. 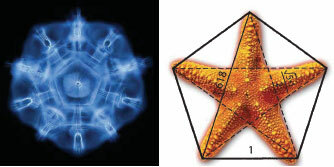 Simple creatures that exhibit angular geometry, such as radiolaria and starfish, provide additional evidence that sound may have been responsible for triggering and/or structuring life. If sound was responsible for triggering life and ordering organisms, we should not be surprised that sound is such a powerful healing modality. Put simply, sound has the almost magical power of restoring order to organisms that are malfunctioning - magical in the sense that we don't yet fully understand how this is accomplished. One way to illustrate how sound may heal is to imagine an orchestra that represents a living organism, such as the human body. If one or more of the musicians are playing off key and the situation is not corrected, it will negatively impact the entire orchestra so that it becomes discordant. It then becomes necessary for a conductor (healing frequencies) to restore order and harmony. The healing frequencies may originate from a modern sound healing instrument or from a traditional method such as the human voice, a gong, a didgeridoo or tuning forks, to name a few. Ina a sense, the body's absorption of harmonic sounds is similar to the life-giving energy absorbed from foods. Harmonic sounds act as nourishment for the body. Sound healing practitioners find that by applying specific sound frequencies to the effected region, normal function returns in most cases. The cells of the organ or system are effectively re-harmonized and re-energized so that cellular re-programming takes place. Modern audible sound therapy instruments are non-invasive and are essentially like playing music to the body. However, the frequencies they employ are carefully targeted, unlike the broad range of frequencies playing music to the body. However, the frequencies they employ are carefully targeted, unlike the broad range of frequencies heard in music and traditional sound healing instruments. Cymatherapy International, for example, is pioneering a new era in therapeutic sound technologies.9 Audible sound therapy has no known side-effects and has been proven to be powerfully efficacious. Thus, we can envisage a future where sound technology is as commonplace in the home as in clinical settings. Resonance is the fundamental principle of sound healing and has various definitions. In the context of sound healing it can be described as the frequency of vibration that is most natural to a specific organ or system, such as the heart, liver or lungs. This innate frequency is known as the prime resonance. The resonance principle does not necessarily require the living system to emit a sound. However, another aspect of resonance refers to cells that are emitting a range of sounds. Here, the resonance principle relates to the cellular absorption of those same sounds and/or their harmonics. In this situation resonance principles are applied to re-harmonized cells that have been imprinted with disruptive frequencies. Such troublesome imprints may have been a result of toxic substances, emotional traumas, pathogens, or long-term exposure to noise pollution. Scientists are faced with the challenge of gaining insight into the biochemistry of cells immersed in sound. One of the many difficulties they face is that the light microscope is somewhat limited in magnification to observe the subtle and complex processes that occur within living cells. Electron microscopes are far more powerful; however, samples must first be desiccated and typically, sliced, making the dynamics of living processes impossible to study with this instrument. Another possible explanation of how sound is able to trigger the healing response relates to cellular ion channels.10 Situated within a cell's membrane, ion channels are the means by which the cell receives nourishment and communicates with neighboring cells. In dysfunctional cells it is proposed that some of these vital channels are shut down. In this hypothesis, sound opens the closed channels, supporting the cell to resume normal functioning and replication. Dr. James Gimzewski, of UCLA, California, has taken a revolutionary approach to studying cellular function.11 He uses an atomic force microscope, a kind of super-sensitive microphone, to listen to the sounds emitted by cells. The focus of this new science, called ‘sonocytology,' is mapping the pulsations of the cell's outer membrane, thus identifying the ‘song' of the cell. Gimzewski's work has revealed that every cell in our bodies has a unique sonic signature and ‘sings' to its neighbors. Sonocytology is a potentially powerful, diagnostic tool for identifying the sounds of healthy cells versus those of injurious ones. But it introduces an even more exciting prospect: the ability to play the destructive sounds of rogue cells back to them greatly amplified, so that they implode and are destroyed. In this scenario there would be no collateral damage to surrounding cells since healthy cells would not resonate with these frequencies. Dr. Gimzewski, himself a Nobel Prize winner, is one of a large number of innovative minds at work in our world that share the vision of creating modalities to assist the body to heal. Audible sound therapy may offer the greatest potential in non-invasive healing. In the years to come we may well see diagnostic and therapeutic beds that resemble a scene from the futuristic, Star Trek sick bay. We will certainly see proliferation in modalities in which sound is the governing principle. Sound heals life naturally. Fig. 5 (above left): Principles of resonance. Fig. 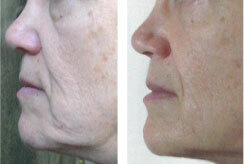 6a (left): a 60-year old woman before Cymatherapy facial rejuvenation course. Fig. 6b (right): The same 60-year old woman after the course of Cymatherapy treatment. Note the general improvement in muscle tone and skin quality, lending a more youthful appearance. Sound is a highly effective tool for healing and, fortunately, an individual does not need to believe in it for it to work. However, there is another factor that can greatly amplify the effectiveness of healing: creative intention. It may be a long time before mainstream medicine recognizes the importance of intention. In contrast, most vibrational energy practitioners, including sound healing therapists, use a holistic approach that addresses both mind and body. When the power of intention is held, the chances of a successful outcome are intensified. Intention consists of using your focused thoughts, feelings and visualizations to attract whatever is desired, such as enhancing one's health. It seems possible that the energy of intention is carried on the wavelengths of sound. American sound healer, Dr. Steven Halpern, believes that, ‘Sound is a carrier wave of consciousness.' One's intention is the spiritual counterpart of the sound and the combination of sound and intention create the outcome of healing. The power of intention involves consciously drawing on the universal field of energy. Utilizing this potent, universal force along with healing sounds has been found to dramatically accelerate the healing process. Many people fall into the trap of fear, or negative intention, particularly in regard to health issues. It is all too easy to fixate upon the possible consequences of a health challenge rather than on the positive expectation of enjoying a healthy, vital life. The universe, it seems, is neutral and will return in kind whatever we focus upon. Whether we are aware of it or not, we use the force of intention either positively or negatively every moment of every day. Our thoughts, feelings and imaginings are the templates for the results and experiences of our lives. In this context, like attracts like. When using creative intention, there is a sense of being deeply inspired. (The word inspiration means in-spirit.) We are motivated to respond to a deeper calling with a firm belief, an absolute knowing that our desire has already been fulfilled. When we merge the mind's energizing force with the universal field of energy for the purpose of healing and creation our health and the quality of our lives can be transformed. One may ask how it is possible to have absolute certainty about a desired outcome before there is any apparent proof. People tend to believe things only when they see them. However, the art of creative intention calls for a new way of thinking: when you believe it, you will see it! It is highly beneficial to the creative process when you act as if you already have what you want. See, feel, and think as if your body is currently vital and whole. When you act as if your desired outcome has already happened, the subconscious mind cannot differentiate between what is factual and what is imagined and believes your intention is actual reality. The mind holds immense healing and creative powers and will continue to work on your behalf as long as you maintain your conscious focus of intention. Perhaps the most important element in ‘acting as if' is to feel the experience of having already manifested your desire. Some people have used these and similar tools of intention but have not experienced the successful outcome for which they had hoped. Generally, it is not because they have applied it incorrectly or missed an important element in the process. Their lack of success usually stems from unresolved issues and detrimental beliefs that are harbored as internal fears in the subconscious mind; issues so old and ingrained that the person may not even be aware of them. Buried fear-based issues and limiting beliefs tend to set up an internal conflict. The conscious mind may want to create a desired outcome, but the overpowering, conflicting influence of unresolved issues and beliefs block success. Nothing can become a part of your reality unless your feelings and your conscious mind are in alignment with the more powerful subconscious mind. Many effective vibrational healing modalities are available to resolve these blocks to well-being and success.12 The magnificent power of intention fully engages when all systems are in alliance, when the thinking-feeling self aligns with the underlying belief system. Intention powered by the healing energy of sound is the key to improved health and other improvements in one's life. Cymatherapy International has underwritten a number of documented case studies to clinically validate their therapeutic sound device. Only by undertaking such studies will audible, sound therapies become medically approved, ultimately leading to their use in medical and veterinary centers worldwide. One Cymatherapy veterinary study involved a thoroughbred racehorse that had sustained a major tendon lesion during a race. With major injuries such as this, horses are usually put down or, at best, relegated to pasture. A return to racing after a severe injury is extremely rare. Throughout this study the horse was under the car of a veterinarian and regular ultrasonographic imaging was used to document the progress of the recovery. The images clearly showed the return to normal, homogeneous, tendon cell integrity. The tendon of the horse not only healed completely using cymatherapy, but there were no traces of scar tissue whatsoever. The horse returned to racing! Clearly, whilst the above study refers to a horse, muscle and tendon injuries in humans are just as readily supported with cymatherapy. Cymatherapy has grown in popularity for its facial rejuvenation capabilities. The combination of specific, audible frequencies used with simple, isometric exercises releases years from a person's facial features. There are growing numbers of people who are enjoying the benefits of looking younger by using the power of sound. A 56-year old woman was involved in a car accident in 2001 and left both knees debilitated. She needed the assistance of a walker or can to get around and her condition was worsening. She was unable to sleep more than an hour or two at a time because of severe pain. Her doctor informed her there was nothing more he could to when he found that her knee joints were down to bone-on-bone. He recommended that she resign herself to buying a power wheelchair and expect to use it the rest of her days. This was harsh news for a woman who had led an active, athletic life. In 2002, a woman had a case of shingles on her upper chest and back. She chold hardly stand up such was the severity of the pain. The only help her doctor could offer was to prescribe adrug to prevent a recurrence. It took the shingles about three months to heal. Early in 2005 the shingles reappeared in exactly the same areas. The Cymatherapy herpes zoster sound signature was applied to the painful areas for 15 minutes. After treatment on the second day she reported that the area tingles and then began to disappear. After using Cymatherapy for four more days, five minutes a day, the shingles had completely disappeared and have not recurred. A client who had a tooth extraction appointment with her dentist decided to try Cymatherapy as a last resort. She was suffering from a very painful abscessed tooth and had been told that the root was disengaged from the jawbone. She was taking 15 ibuprofen tablets a day for the excruciating pain. Several dental sound signatures were applied, including abscess, apical foramen and root canal. The tooth immediately began to feel better and she was able to cut back on the painkillers. After half a dozen sessions she was totally pain-free and she retained her tooth. Her dentist was amazed. In 1938 another German scientist, Raimar Pholman, demonstrated ultrasound's therapeutic properties in a Berlin physiotherapy clinic. By the 1950's ultrasound had become a widely used sound healing modality. To this day it remains a mystery as to precisely how it helps the body heal. Cymatherapy International bought the rights for the technology from Manners (said to be 103, a good advertisement for his device!) and now manufactures the Cymatherapy machine in the USA. Their version uses advanced computers to create ultrapure tones, mostly in sets of five. It has 700 ‘codes' that address a huge range of injuries and ailments. There are many other sound healing modalities currently entering he market place, including personal therapeutic ultrasound units manufactured in the Far East, many of which find their way into people's homes. Fig. 7a (left): The Novasonic device. Fig. 7b (right): The ‘Cyma 1000' by Cymatherapy International. (Combined Electric Field and Ultrasound), http://www.gendel.co.uk . 5. Alexandersson, O. Living water: Victor schauberger and the Secrets of Natural Energy, Gateway Books, 1996. 7. Lauterwasser A. Water Sound Images, Macromedia Publishing, Newmarket, NH, USA, 2006. 8. Young, M. Viruses have plagued the Earth for 3 billion years. New Scientist, no 2446, 8 May, 2004. 9. Cymatherapy International. www.cymatherapy.com . 12. The DNA of Healing, www.possibilitiesdna.com; Emotional Freedom Technique (EFT), www.emofree.com; Gould C. Hypnotherapy within the UK.